While Slack was announcing its new logo yesterday, we were preparing this brief article to show you how easily brands can receive their new product reviews from eCommerce websites right into their preferred Slack channel. 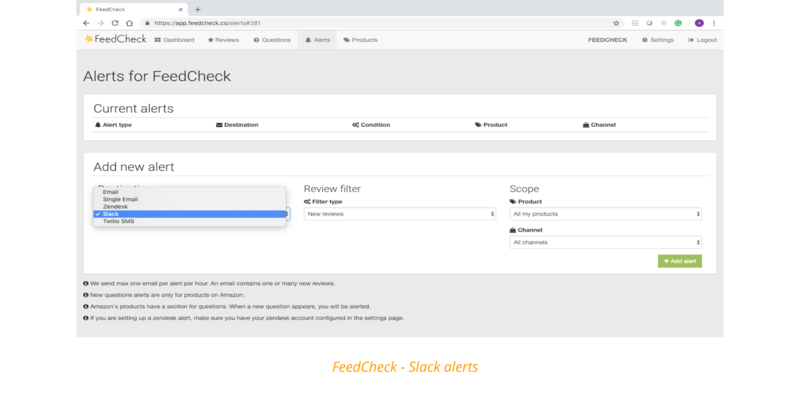 This is not a new feature of our product review monitoring platform, FeedCheck.co, but it happens that many of our customers lately have started to appreciate it, finding it a useful means to stay connected to their new product reviews that consumers leave in the eCommerce space. A preference is a preference and that is why FeedCheck is here: to connect brands to their product reviews wherever that is most convenient for our customers: email, slack, zendesk, SMS and even Twilio. Whoever needs to hear, listen to and discuss what their consumers say about their products through their eCommerce reviews and does not want to wait for the “traditional weekly meeting” in order to dissect the issues, might want to take a look at how our Slack integration can help them speed things up. Those of you who are more agile concerning these things, most likely have already adopted Slack within your firm or are going to, and will highly benefit from this feature. Choosing Slack instead of email review notifications depends very much on the reviews’ recipient role. If you are a Consumer Goods brand, you may very well read your reviews via Slack. But if you’re a marketing/PR agency, where distributed and rotating staff need to receive and reply to your clients’ product reviews, from basically everywhere, then email notifications might still suit you better. From Settings / Integrations, select your preferred Slack channel where you want FeedCheck to re-route your product reviews. Once you selected the Slack channel, test the integration. Now that you know that the integration works for your account, do not forget to tell FeedCheck which reviews it should re-route towards your Slack channel. Here you have more options to choose from: from all new reviews to reviews that meet certain rules i.e. below 3 stars or all new reviews etc., from all your products and eCommerce websites to only the selected ones, whichever best responds to your needs. As an additional step though, make sure that all your team members interested in receiving new product reviews on Slack do have access to the reviews Slack channel! Otherwise, you might hear complaints that not everyone is in the loop of what the latest product issues are. Whichever product review delivery channel you may choose for your business, all your product reviews will always be aggregated and monitored with FeedCheck. Therefore, you have full flexibility in switching between all these delivery means depending on how your R&D/product management or customer support functions are organized at that moment in time.